Update, April 2. 2018: Development on Breakaway has officially ended at Amazon Game Studios. Check out the best multiplayer games on PC. This news isn’t altogether surprising given the unconfirmed reports around the previous announcement, which suggested that the game had already essentially canned. There was no word of layoffs at the time, though we don’t know if that will continue to be the case, especially considering the layoffs at Amazon-owned Twitch last week. Original story, October 26, 2017: Things have felt pretty quiet with Amazon Game Studios in recent months, given what a wild revelation it was that the retailing giant was getting into game development, but there’s finally a big announcement concerning their flagship title Breakaway – it’s essentially cancelled. Maybe not quite the news we were hoping for. 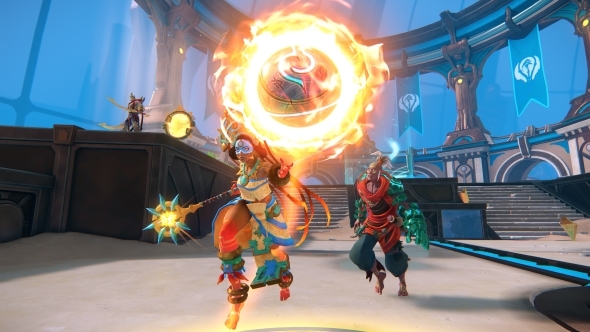 That might sound like a small hiatus rather than a complete retooling of the game, but based on a report Kotaku published just prior to the announcement, it sounds like Breakaway will be rebuilt from the ground up – assuming it returns at all. Their sources suggest an “indefinite hiatus” for Breakaway, a likelihood only hinted at from the official announcement. Breakaway was set to be a multiplayer, team-based action game combining characteristics of Overwatch and football, alongside heavy integration with Amazon-owned Twitch streaming. A new trailer released in August, and it seems that the final public alpha closed at the end of September. Amazon’s Lumberyard game engine appears to still be in development, though none of its high profile titles – including the notoriously oft-delayed Star Citizen – have yet come to fruition. Though it seems no layoffs are planned at Amazon Game Studios, much of the studio’s apparent promise has worn off since it was formed with some of the biggest names in game development. Former Ubisoft designer Clint Hocking left the studio shortly after it was announced, and Portal designer Kim Swift has similarly moved onto other endeavors. It’s generally been a poor day for in-development multiplayer titles, as Digital Extremes’ new shooter The Amazing Eternals also went on hiatus today.